At the time of the first discoveries, Europeans tended to view the New World from one of two contrasting perspectives. Many saw America as an earthly paradise, where the native peoples led lives of simplicity and freedom similar to those enjoyed by Adam and Eve in the Biblical Garden of Eden. Other Europeans described America in a much more negative light: as a dangerous and forbidding wilderness, a place of cannibalism and human misery, where the population lacked Christian religion and the trappings of civilization. But it was the positive view of America as a land of liberty, liberation, and material wealth that would remain dominant. 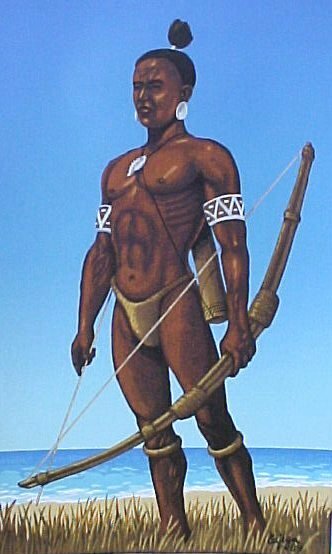 In a letter reporting his discoveries to Luis de Sant Angel, the Chancellor of the Exchequer, and to the King and Queen of Spain, Christopher Columbus (1451-1506) paints a portrait of the indigenous Taino Indians as living lives of freedom and innocence. 1. Analyze why Columbus would want to describe the natives as he does in a communication to the Spanish court. 2. In what descriptions does Columbus betray a patronizing attitude? How does this judgment influence Spanish behavior on Hispaniola? 3. How would you characterize the Natives’ attitudes toward possessions? As I saw that they were very friendly to us, and perceived that they could be much more easily converted to our holy faith by gentle means than by force, I presented them with some red caps, and strings of beads to wear upon the neck, and many other trifles of small value, wherewith they were much delighted, and became wonderfully attached to us. Afterwards they came swimming to the boats, bringing parrots, balls of cotton thread, javelins, and many other things which they exchanged for articles we gave them, such as glass beads, and hawk’s bells; which trade was carried on with the utmost good will. But they seemed on the whole to me, to be a very poor people. They all go completely naked, even the women, though I saw but one girl. All whom I saw were young, not above thirty years of age, well made, with fine shapes and faces; their hair short, and coarse like that of a horse’s tail, combed toward the forehead, except a small portion which they suffer to hang down behind, and never cut. Some paint themselves with black, which makes them appear like those of the Canaries, neither black nor white; others with white, others with red, and others with such colors as they can find. Some paint the face, and some the whole body; others only the eyes, and others the nose. Weapons they have none, nor are acquainted with them, for I showed them swords which they grasped by the blades, and cut themselves through ignorance. They have no iron, their javelins being without it, and nothing more than sticks, though some have fish-bones or other things at the ends. They are all of a good size and stature, and handsomely formed. I saw some with scars of wounds upon their bodies, and demanded by signs the of them; they answered me in the same way, that there came people from the other islands in the neighborhood who endeavored to make prisoners of them, and they defended themselves. I thought then, and still believe, that these were from the continent. It appears to me, that the people are ingenious, and would be good servants and I am of opinion that they would very readily become Christians, as they appear to have no religion. They very quickly learn such words as are spoken to them. If it please our Lord, I intend at my return to carry home six of them to your Highnesses, that they may learn our language. I saw no beasts in the island, nor any sort of animals except parrots. Columbus’ return to the Iberian peninsula intensified the rivalry between Spain and Portugal. Apparently, he landed in Portugal, and gave details about his travels in the Caribbean when he was invited to the Portugese court on March 4, 1493. Upon hearing Columbus’ tale, King John II of Portugal claimed the lands Columbus and his crew had discovered under the terms of the Treaty of Alcacovas of 1479 and the Papal bull Aeterni regis of 1481 issued by Pope Sixtus IV. A Papal bull is an formal proclamation or order from the Pope. Ferdinand and Isabella reported the news of the discovery to Pope Alexander VI, who was by birth a Spaniard. Alexander VI issued a Papal bull, Inter caetaera, which supported the Spanish claim to the lands claimed by Columbus while granting the Portugese a share of the new lands as well. Therefore, Inter Caetera established a dividing line running from the North Pole to the South Pole along 38 degrees west latitude. 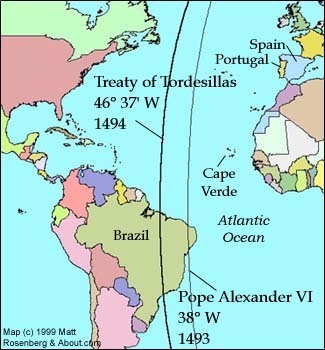 Ferdinand and Isabella eventually entered into negotiations with Portugal in the Spanish town of Tordesillas, which moved the dividing line further west to a latitude of 46 degrees, 37 minutes west latitude, thus giving Portugal claim to what would later become Brazil. As you read, consider this question: Under what justification does the Pope believe that he has the right to distribute ownership of the non-European world? Among other works well pleasing to the Divine Majesty and cherished of our heart, this assuredly ranks highest, that in our times especially the Catholic faith and the Christian religion be exalted and be everywhere increased and spread, that the health of souls be cared for and that barbarous nations be overthrown and brought to the faith itself. Wherefore inasmuch as by the favor of divine clemency, we, though of insufficient merits, have been called to this Holy See of Peter, recognizing that as true Catholic kings and princes, such as we have known you always to be, and as your illustrious deeds already known to almost the whole world declare, you not only eagerly desire but with every effort, zeal, and diligence, without regard to hardships, expenses, dangers, with the shedding even of your blood, are laboring to that end; recognizing also that you have long since dedicated to this purpose your whole soul and all your endeavors — as witnessed in these times with so much glory to the Divine Name in your recovery of the kingdom of Granada from the yoke of the Saracens — we therefore are rightly led, and hold it as our duty, to grant you even of our own accord and in your favor those things whereby with effort each day more hearty you may be enabled for the honor of God himself and the spread of the Christian rule to carry forward your holy and praiseworthy purpose so pleasing to immortal God. We have indeed learned that you, who for a long time had intended to seek out and discover certain islands and mainlands remote and unknown and not hitherto discovered by others, to the end that you might bring to the worship of our Redeemer and the profession of the Catholic faith their residents and inhabitants, having been up to the present time greatly engaged in the siege and recovery of the kingdom itself of Granada were unable to accomplish this holy and praiseworthy purpose; but the said kingdom having at length been regained, as was pleasing to the Lord, you, with the wish to fulfill your desire, chose our beloved son, Christopher Columbus, a man assuredly worthy and of the highest recommendations and fitted for so great an undertaking, whom you furnished with ships and men equipped for like designs, not without the greatest hardships, dangers, and expenses, to make diligent quest for these remote and unknown mainlands and islands through the sea, where hitherto no one had sailed; and they at length, with divine aid and with the utmost diligence sailing in the ocean sea, discovered certain very remote islands and even mainlands that hitherto had not been discovered by others; wherein dwell very many peoples living in peace, and, as reported, going unclothed, and not eating flesh. Moreover, as your aforesaid envoys are of opinion, these very peoples living in the said islands and countries believe in one God, the Creator in heaven, and seem sufficiently disposed to embrace the Catholic faith and be trained in good morals. And it is hoped that, were they instructed, the name of the Savior, our Lord Jesus Christ, would easily be introduced into the said countries and islands. Also, on one of the chief of these aforesaid islands the said Christopher has already caused to be put together and built a fortress fairly equipped, wherein he has stationed as garrison certain Christians, companions of his, who are to make search for other remote and unknown islands and mainlands. In the islands and countries already discovered are found gold, spices, and very many other precious things of divers kinds and qualities. Wherefore, as becomes Catholic kings and princes, after earnest consideration of all matters, especially of the rise and spread of the Catholic faith, as was the fashion of your ancestors, kings of renowned memory, you have purposed with the favor of divine clemency to bring under your sway the said mainlands and islands with their residents and inhabitants and to bring them to the Catholic faith. Hence, heartily commending in the Lord this your holy and praiseworthy purpose, and desirous that it be duly accomplished, and that the name of our Savior be carried into those regions, we exhort you very earnestly in the Lord and by your reception of holy baptism, whereby you are bound to our apostolic commands, and by the bowels of the mercy of our Lord Jesus Christ, enjoin strictly, that inasmuch as with eager zeal for the true faith you design to equip and despatch this expedition, you purpose also, as is your duty, to lead the peoples dwelling in those islands and countries to embrace the Christian religion; nor at any time let dangers or hardships deter you therefrom, with the stout hope and trust in your hearts that Almighty God will further your undertakings. And, in order that you may enter upon so great an undertaking with greater readiness and heartiness endowed with the benefit of our apostolic favor, we, of our own accord, not at your instance nor the request of anyone else in your regard, but of our own sole largess and certain knowledge and out of the fullness of our apostolic power, by the authority of Almighty God conferred upon us in blessed Peter and of the vicarship of Jesus Christ, which we hold on earth, do by tenor of these presents, should any of said islands have been found by your envoys and captains, give, grant, and assign to you and your heirs and successors, kings of Castile and Leon, forever, together with all their dominions, cities, camps, places, and villages, and all rights, jurisdictions, and appurtenances, all islands and mainlands found and to be found, discovered and to be discovered towards the west and south, by drawing and establishing a line from the Arctic pole, namely the north, to the Antarctic pole, namely the south, no matter whether the said mainlands and islands are found and to be found in the direction of India or towards any other quarter, the said line to be distant one hundred leagues towards the west and south from any of the islands commonly known as the Azores and Cape Verde. With this proviso however that none of the islands and mainlands, found and to be found, discovered and to be discovered, beyond that said line towards the west and south, be in the actual possession of any Christian king or prince up to the birthday of our Lord Jesus Christ just past from which the present year one thousand four hundred and ninety-three begins. And we make, appoint, and depute you and your said heirs and successors lords of them with full and free power, authority, and jurisdiction of every kind; with this proviso however, that by this our gift, grant, and assignment no right acquired by any Christian prince, who may be in actual possession of said islands and mainlands prior to the said birthday of our Lord Jesus Christ, is hereby to be understood to be withdrawn or taken away. Moreover we command you in virtue of holy obedience that, employing all due diligence in the premises, as you also promise — nor do we doubt your compliance therein in accordance with your loyalty and royal greatness of spirit — you should appoint to the aforesaid mainlands and islands worthy, God-fearing, learned, skilled, and experienced men, in order to instruct the aforesaid inhabitants and residents in the Catholic faith and train them in good morals. Furthermore, under penalty of excommunication late sententie to be incurred ipso facto, should anyone thus contravene, we strictly forbid all persons of whatsoever rank, even imperial and royal, or of whatsoever estate, degree, order, or condition, to dare, without your special permit or that of your aforesaid heirs and successors, to go for the purpose of trade or any other reason to the islands or mainlands, found and to be found, discovered and to be discovered, towards the west and south, by drawing and establishing a line from the Arctic pole to the Antarctic pole, no matter whether the mainlands and islands, found and to be found, lie in the direction of India or toward any other quarter whatsoever, the said line to be distant one hundred leagues towards the west and south, as is aforesaid, from any of the islands commonly known as the Azores and Cape Verde; apostolic constitutions and ordinances and other decrees whatsoever to the contrary notwithstanding…. 1. How have humans reversed the ancient trend of biodiversification? 2. What group of people first introduced new species to the Americas? 3. Crosby discusses European motives and intentions in their explorations in the Western Hemisphere. What were the motives Crosby lists for the initiation of contact by Europeans in the Americas? What does he describe as their intentions? 4. How does Crosby categorize where differences were most acute among the four continents considered in the Columbian Exchange? 1. Summarize how the author describes the character of the Indian natives. 2. By describing why he believes the Taino are not greedy, what implicit indictment does de las Casas make against the conquistadores? 3. Quantify what effect de las Casas claims the Spanish had upon the Taino population. And of all the infinite universe of humanity, these people are the most guileless, the most devoid of wickedness and duplicity, the most obedient and faithful to their native masters and to the Spanish Christians whom they serve. They are by nature the most humble, patient, and peaceable, holding no grudges, free from embroilments, neither excitable nor quarrelsome. These people are the most devoid of rancors, hatreds, or desire for vengeance of any people in the world. And because they are so weak and complaisant, they are less able to endure heavy labor and soon die of no matter what malady. The sons of nobles among us, brought up in the enjoyments of life’s refinements, are no more delicate than are these Indians, even those among them who are of the lowest rank of laborers. They are also poor people, for they not only possess little but have no desire to possess worldly goods. For this reason they are not arrogant, embittered, or greedy. Their repasts are such that the food of the holy fathers in the desert can scarcely be more parsimonious, scanty, and poor. As to their dress, they are generally naked, with only their pudenda covered somewhat. And when they cover their shoulders it is with a square cloth no more than two varas in size. They have no beds, but sleep on a kind of matting or else in a kind of suspended net called bamacas. They are very clean in their persons, with alert, intelligent minds, docile and open to doctrine, very apt to receive our holy Catholic faith, to be endowed with virtuous customs, and to behave in a godly fashion. And once they begin to hear the tidings of the Faith, they are so insistent on knowing more and on taking the sacraments of the Church and on observing the divine cult that, truly, the missionaries who are here need to be endowed by God with great patience in order to cope with such eagerness. Some of the secular Spaniards who have been here for many years say that the goodness of the Indians is undeniable and that if this gifted people could be brought to know the one true God they would be the most fortunate people in the world. Yet into this sheepfold, into this land of meek outcasts there came some Spaniards who immediately behaved like ravening wild beasts, wolves, tigers, or lions that had been starved for many days. And Spaniards have behaved in no other way during the past forty years, down to the present time, for they are still acting like ravening beasts, killing, terrorizing, afflicting, torturing, and destroying the native peoples, doing all this with the strangest and most varied new methods of cruelty, never seen or heard of before, and to such a degree that this Island of Hispaniola once so populous (having a population that I estimated to be more than three million), has now a population of barely two hundred persons. The island of Cuba is nearly as long as the distance between Valladolid and Rome; it is now almost completely depopulated. San Juan [Puerto Rico] and Jamaica are two of the largest, most productive and attractive islands; both are now deserted and devastated. On the northern side of Cuba and Hispaniola he the neighboring Lucayos comprising more than sixty islands including those called Gigantes, beside numerous other islands, some small some large. The least felicitous of them were more fertile and beautiful than the gardens of the King of Seville. They have the healthiest lands in the world, where lived more than five hundred thousand souls; they are now deserted, inhabited by not a single living creature. 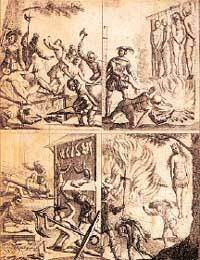 All the people were slain or died after being taken into captivity and brought to the Island of Hispaniola to be sold as slaves. When the Spaniards saw that some of these had escaped, they sent a ship to find them, and it voyaged for three years among the islands searching for those who had escaped being slaughtered , for a good Christian had helped them escape, taking pity on them and had won them over to Christ; of these there were eleven persons and these I saw. More than thirty other islands in the vicinity of San Juan are for the most part and for the same reason depopulated, and the land laid waste. On these islands I estimate there are 2,100 leagues of land that have been ruined and depopulated, empty of people. As for the vast mainland, which is ten times larger than all Spain, even including Aragon and Portugal, containing more land than the distance between Seville and Jerusalem, or more than two thousand leagues, we are sure that our Spaniards, with their cruel and abominable acts, have devastated the land and exterminated the rational people who fully inhabited it. We can estimate very surely and truthfully that in the forty years that have passed, with the infernal actions of the Christians, there have been unjustly slain more than twelve million men, women, and children. In truth, I believe without trying to deceive myself that the number of the slain is more like fifteen million. The Encounter between Native and European was certainly not one-sided. The Aztecs have also left behind a record of their impressions of the Spanish. Montezuma sent messengers to meet with Cortés, to present him gifts and greetings. Cortés responded with as de las Casas described: by discharging his weapons in an attempt to awe the natives. The messengers reported back to Montezuma their impressions, which had a strong effect upon the great warrior. 1. Compare the impression the Aztecs had with that of the Europeans. What characteristics did each find remarkable about the other? What does this indicate about the cultures of each group? 2. How might Montezuma’s reaction have contributed to the Spanish conquest of the Americas? 3. What do you think was the purpose of the dogs? Why would the Spanish bring dogs with them? The messengers also said: “Their trappings and arms are all made of iron. They dress in iron and wear iron casques [helmets] on their heads. Their swords are iron; their bows are iron; their shields are iron; their spears are iron. Their deer carry them on their backs wherever they wish to go. These deer, our lord, are as tall as the roof of a house. “The strangers’ bodies are completely covered, so that only their faces can be seen. Their skin is white, as if it were made of lime. They have yellow hair, though some of them have black. Their beards are long and yellow, and their moustaches are also yellow. Their hair is curly, with very fine strands. When [Montezuma] heard this report, he was filled with terror. It was as if his heart had fainted, as if it had shriveled. It was as if he were conquered by despair. Was the Homestead Act a success? Posted by scoop2go in Chapter 26, Exploration, Frontier/ Native Americans. Comments Off on Was the Homestead Act a success? Before the passage of the Homestead Act, the Great Plains had often been referred to by geographers as “The Great American Desert” due to its common pattern of drought and generally arid conditions. However, once the Homestead Act was passed, the area along the 1ooth Meridian was often advertised, especially by the railroads and their land agents, as a veritable paradise. In reality, this was a place of long droughts and sudden downpours, although the snowstorm and thunderstorms never managed to counterbalance the drought. What were the problems with the Homestead Act? Was 160 acres enough land to support a family in the “desert” of the Great Plains? That number had been chosen because it was more than adequate for the support of a family in the Ohio Valley. But the Great Plains had entirely different soil, topography, and climate, with very little surface water available, fewer trees, and limited technology at the time to do anything about it. Of course, some scientists tried to warn about the ecological disaster that could ensue. One of these was John Wesley Powell, a fascinating character in his own right who explored much of the Desert Southwest, including the Colorado River, even though he only had one arm. Powell warned that large settlements dependent upon agriculture would not really be possible west of the 100th Meridian— the western boundary of Oklahoma and Texas. 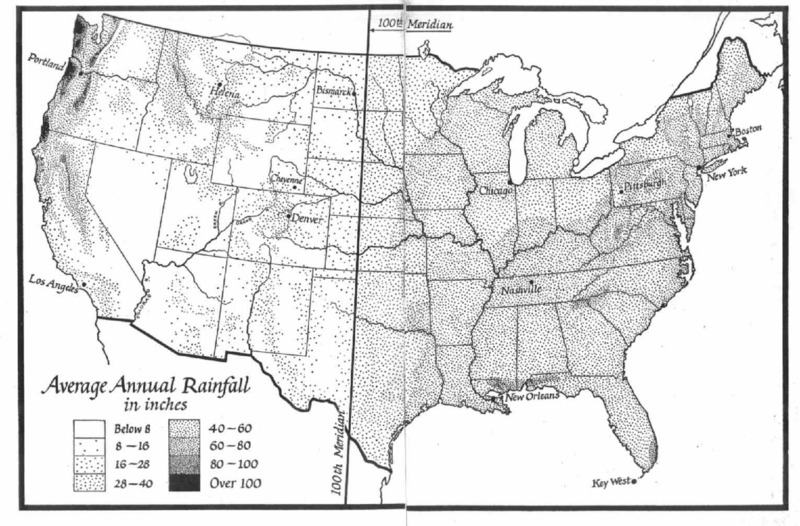 Unfortunately, more people believed a discredited theory of climatology that “the rain follows the plow.” The general idea was that, once the plows of the settlers turned over the original sod, moisture would be released into the air, priming the water cycle and increasing rainfall. I know– crazy! However, just by chance, the 1870s and 1880s were unusually wet, and so many people, including some who called themselves scientists, considered this fluke of weather to be proof of man-made climate change.